Weekend Directional Signage is an excellent way to lead potential home-buyers and apartment-renters to your communities. At The Redirections Group, we work with Muesing Management in Indianapolis and the surrounding areas to create the best signage for their needs. Read on to learn all about the available apartments and their amenities. Looking for a charming community in the Northeast Indianapolis area? Chateau in the Woods is the place for you to call home. Conveniently located near I-465 and I-69, this complex offers up to 1590 sq. ft. of apartment living, and includes one, two and three-bedroom apartments. Amenities include a fitness center, clubhouse, swimming pool and 24-hour maintenance. All apartments are air-conditioned, cable ready, and include a fully equipped kitchen. When you’re searching for an apartment on the north side of Indianapolis, you can’t go wrong with College Court of Nora. This complex is centrally located to entertainment, shopping and dining options with easy access to I-465. You can select from numerous one and two-bedroom floorplans. Don’t forget to head over to the swimming pool for a fun day in the sun! Creek Bay is a go-to choice on the south side of Indianapolis. Choose either a one or two-bedroom apartment home, which includes a screened-in patio or balcony. If you’re a student attending the University of Indianapolis, your commute is only three miles! You can even bring a couple small pets with you. Just minutes to downtown, Fallwood Apartments is located in the wooded acres of the northeast side of Indianapolis. With expansive floorplans up to 1300 sq. ft, this complex is ideal for individuals and small families. Enjoy the swimming pool and fitness center or walk through the 26 acres of wooded grounds. When living at Ivy Knoll, you can experience Castleton living at its best! Only minutes away from Castleton Square Mall and I-465, you will find one and two-bedroom apartment homes with 1195 sq. ft. Features include fully equipped kitchens, a balcony or patio, plush carpet and 24-hour emergency maintenance. Choose between a one, two or three-bedroom floorplan at the Woods of Castleton. There are several community amenities, including tennis courts, a dog park, beach volleyball, and a high-tech fitness center. Unit amenities include walk-in closets, built-in bookshelves, formal dining areas and private patios or balconies. 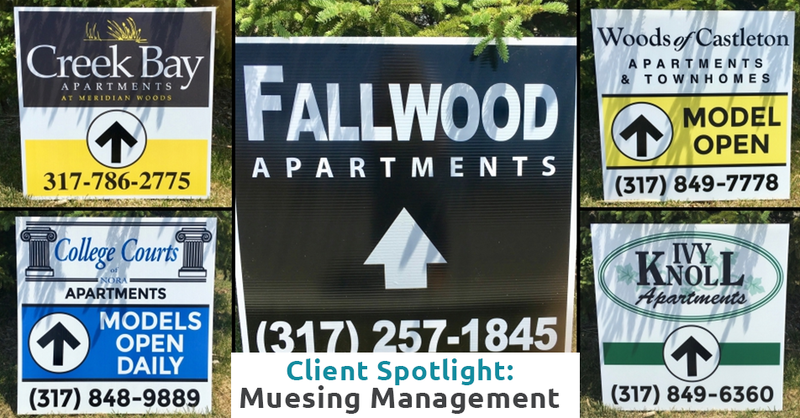 Muesing Management has several apartment homes available in and around the Indianapolis area! We help direct their clients to their communities by creating Weekend Directional Signage. Call us today at The Redirections Group to learn more about our signage and to decide which option is best for your business.